Christine Klocek-Lim was born in the coal-mining region of northeastern Pennsylvania. She now resides in southeastern Pennsylvania with her husband and two sons. She has worked as an editor, online poetry forum administrator, technical writer, copy editor, proofreader, and documentation specialist. Christine Klocek-Lim received the 2009 Ellen La Forge Memorial Prize in poetry and was a finalist in Nimrod’s 2006 Pablo Neruda Prize for Poetry. Her chapbook, The book of small treasures, will be published in December 2009 by Seven Kitchens Press. Her poems have appeared in Nimrod, OCHO, The Pedestal Magazine, Terrain.org, the anthology Riffing on Strings: Creative Writing Inspired by String Theory and elsewhere. She is editor of Autumn Sky Poetry, serves on the Board of Directors for The Externalist—A Journal of Perspectives, and her website is www.novembersky.com. During my twenties, I didn’t write very many poems; I loved language and playing with words, but didn’t feel I had anything vital to say. However, by the time I reached my thirties, I began to think about relationships: how we love, how we say hello or goodbye to someone who carries a piece of our spirit. Love, to me, is complicated and not always pretty. I wrote these poems over the course of five years, thinking all the time about how we love each other: parent or grandparent to child, friend to friend, lover to lover. For me, the poems in this collection are a transcription of that experience, encompassing not only the pain, but also the joy and the utter complexity of what love can be. When we discover a poet who touches us, we learn to appreciate the skill with which their poetry is crafted, and we marvel at their ability to transport us into the worlds they create. Appreciation comes both in our comprehension and in our perception of the world around us. We process words cognitively and are also affected by them aesthetically. When I read poetry, it is the aesthetic hemisphere of my brain that takes the lead. It recognizes the beauty of a poem long before the cognitive comprehends why. This is the case whenever I read the poetry of Christine Klocek-Lim. Over the course of the past few years, I have come to appreciate not only her skill as a poet, but also the care with which she treats the subjects of her poetry. She often writes of personal and sensitive issues, of moments filled with struggle and heartache, and of loss; yet in each instance, regardless of the weight, each subject is treated with respect and reverence, and the strength of each encounter is revealed. How to photograph the heart ignites our memories, not just with familiar visions of the natural world sewn into fluid language and personification but also with the raw release of images that takes us beyond what is normally perceived. Amid these angles of loss and grief, Klocek-Lim interlaces love, want, and the simple complexities of togetherness. We’re left with a longing to know the clarity of love and the human condition and the ways in which to focus, stop, and shoot what lies beneath the chest, what sustains us and moves “in the luminous silence” that is shared in her title poem. A slightly different review is offered by Theresa Senato Edwards at Holly Rose Review. To photograph the heart is to make visible the unseen, but paradoxically it also is to make the familiar new and even mysterious. Arguably, these have always been the poet’s tasks. In this first gathering of her poems, Christine Klocek-Lim presents pictures of the heart’s landscape—relationships, memories, loss, love, grief, mutability—a well-charted but still mysterious terrain. These poems are unrelentingly inward looking, which is a tricky business for a poet, but when they succeed they do so by tying their introspections to a recognizable external world. At that point they transcend the merely personal and gain emotional currency in a world the reader recognizes. The title of this chapbook is both an instruction and a question. In the end, though, these poems are less a set of directions than attempts at answering that question. Read the full review here or here. 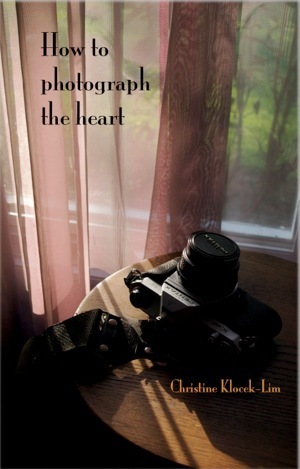 A slim chapbook that opens with the title poem, How to photograph the heart. This poem reminds me of Ruth Stone’s short, yet highly evocative poetry, the kind of poems that one can pick up, read and then carry around the rest of the day, luxuriating in the language and images the poet has captured. If this was the only poem in the book, it would be worth the trip in, but the poet has additional wonders. Ms. Klocek-Lim moves in the book between poems and between sections (rain, fragile, beloved) with grace. There are moments of sheer beauty, Dearly Beloved, a wedding poem that tips very close to the abstract but manages to pile on good concrete images that build up and then trail off like a comet’s tail. That this is achieved in three brief stanzas is a bit of skill and surprise. I rely on the poet to take me through her journey, and this journey is satisfying. It is rare that I get a chance to review a new work, work by a poet whose poems I know and enjoy; Rarer to be able to wholly recommend the work to others. On the surface, this is a book about relationships, a relatively common theme in poetry. However, this book stands out because the relationships are approached in new and interesting ways. [I]n “Learning to Speak American,” Klocek-Lim notes that “We studied friendship for a year/before he described his escape from Poland.” The poem as a whole studies friendship through the catalyst of language while also adding a touch of social commentary, and “Twenty-year love poem” is one part love poem, two parts discussion of socioeconomics. Poems like these show the reader that they are not reading a book about relationships. They are reading a book about the form that life takes after being molded by those relationships, an altogether different theme from poetry-as-usual. A wonderful interview with Christine at WordPress.